The main Olympic Post Office at Wembley was well sited in the Stadium grounds on one of the main approaches to the Stadium. It comprised a public office of about 670 square feet, with a counter 29 feet long to accommodate six clerks, a public telephone hall of about 520 square feet, a telegraph instrument room of about 950 square feet, and several small rooms for clerical work, messengers and cloaks amounting to about 530 square feet. The busiest periods were the three hours before the afternoon session at the Stadium and the hour or so after the last event. Little business was done between 9 p.m. and 10 p.m. on most days. Temporary Post Office facilities were provided at Torquay. A counter 18 feet long was installed and a posting box was erected near by. Poste Restante facilities were provided at all Games Post Offices and used extensively. Business started soon after 8 a.m., reaching its peak between 9 and 9.30 a.m. Business was then quiet throughout the day. The special issues of 2½d., 3d., 6d. and 1/- commemorative stamps were on sale at all Post Offices in the country. 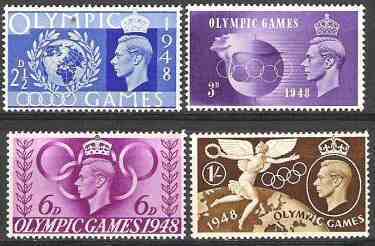 Those affixed to letters posted in the posting boxes in the Stadium grounds at Wembley were cancelled with a special Olympic Games commemorative cancellation stamp. Consequently, the Olympic Post Office was thronged with people buying stamps and completing letters for the post and much more public office space than that provided was necessary at times, particularly on the first day. On the whole, however, the provision made for counter service was reasonably satisfactory. About 40 per cent. of persons using the Office were from abroad and the services of an interpreter provided by the Post Office in the public office were much appreciated. A small public office was also provided in the Stadium itself, alongside the positions allotted to the several cable companies. This office was primarily for the convenience of press correspondents wishing to send messages to places in Europe served by Post Office telegraphs, but little use was made of the facility. The office was open only when events were in progress and for one hour before and after. The Organising Committee kept the Post Office informed of the location of the various teams for the re-direction of mail and cables. 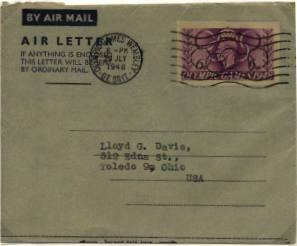 About 3,000 letters per day were dealt with in this way ; there were about 150 parcels in all. Mail and telegrams were delivered to the Camp Commandant at the appropriate housing centre and he assumed responsibility for delivery to the individual competitor or team official. This arrangement worked well. 5. 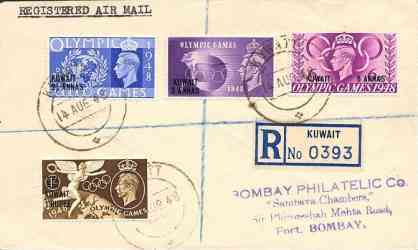 There is no philatelic department in the British Post Office and no special arrange ments were made for the benefit of philatelists in connection with the issue of the Commemorative 2½d., 3d., 6d. and 1/- stamps and 6d. air letter forms except that posting boxes in the Wembley Stadium grounds were specially marked in French, Spanish and English to indicate that items posted therein would be stamped with a special Olympic Games postmark. 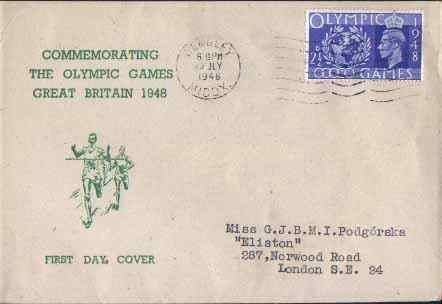 Only unregistered items, which were suitable in size and make up for passing through an ordinary stamp cancelling machine and which were posted in these boxes or handed over the counter at the Olympic Games Post Office at Wembley, bore this special postmark. 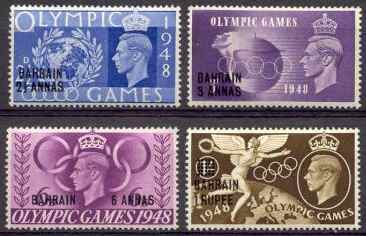 The Olympic Games stamps were on sale at all Post Offices in the United Kingdom from July 29, 1948 ; they were withdrawn from sale on December 31,1948. Globe and Laurel Wreath 63 62 ? Olympic Symbol 65 64 ? Winged Victory 66 65 ? Globe and Laurel Wreath 76 77 ? Olympic Symbol 78 79 ? Winged Victory 79 80 ? 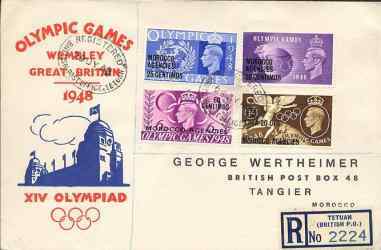 The Olympic Games special postage stamps from GB with overprint: "MOROCCO AGENCIES"
Special Postmark: Olympic Games Wembley. GT. Brit.